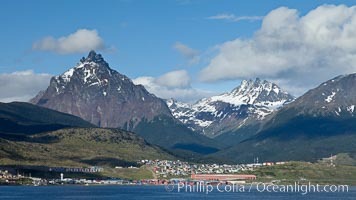 Mount Olivia (1318m) and the Five Brothers (Mount Cinco Hermanos, 1280m) in the Fuegian Andes rise above Ushuaia, the capital of the Tierra del Fuego region of Argentina. The Beagle Channel fronts Ushuaia in the foreground. Mount Olivia Photo.